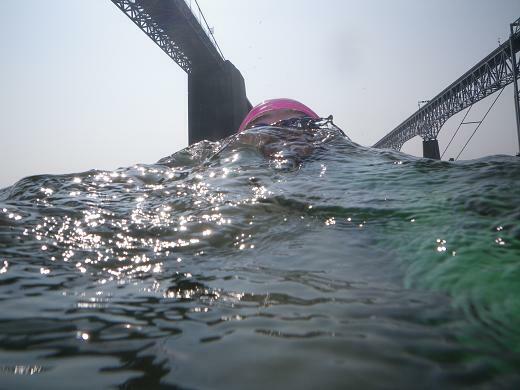 Visuals of the Great Chesapeake Bay Bridge Swim, thanks to Rob at RobAquatics.com. I stumbled upon his terrific post-race report from the 2010 swim, complete with mid-race photos, last week. Looking at the photo below, I can practically feel the cool, brackish Bay water on my own face, which makes the race seem oh-so-real. Rob Dumouchel's mid-race self portrait. 50K in May. I started this swim challenge last week. As the name suggests, it has me swimming 50,000 meters this month, which means actually completing my training minimums for the 4.4-mile Great Chesapeake Bay Bridge Swim. I already feel totally buoyed by my ability to nail my first week, totaling 12,000 meters as of Saturday afternoon, when I completed what felt like a landmark swim. There was nothing special about it, except for the fact that I got in the pool thinking: “Oh! Only a 3,000!” That’s like getting excited over a “short” run of “only” 10 miles during marathon training. The chance to write a story about a topic I’m passionate about. I’ve spent months trying to find a home for a story about disordered eating— in which a person doesn’t have an eating disorder, but harbors unhealthy thoughts, feelings or behaviors related to food and his or her body—among women runners. I’m thrilled to get the chance to write it for Women’s Running, and am interested in hearing your thoughts on the topic. Have you struggled with disordered eating? Leave a comment below, or e-mail jessica @ womensrunning.com, to share your experience. And most importantly, training for the Bolder Boulder 10K, with a purpose. In November, we received a piece of news that turned our world upside down: Steve’s mom was diagnosed with small-cell cancer. We can’t cure cancer. But we can run a race to raise money to help the people who *can* cure cancer, and that’s what we’re doing. Steve had the great idea to run the Bolder Boulder 10K, located close to where he grew up in Lakewood, Colo., as a fund-raiser for the American Cancer Society, on behalf of his mom. It’s in the city where I went to school, where Steve and I met, and we’re hoping his mom feels up to coming to the race to watch us cross the finish line in University of Colorado’s Folsom Field. You can find more details about the above on our fund-raising page. If you’ve already donated, I can’t tell you how grateful and honored I am. If you haven’t, please know I appreciate every penny—or every piece of emotional support you can lend to our mission, as it’s about more than just the fund-raising. Stay tuned for a full post later this week about my goals and motivations for the race. I’m so impressed and motivated by all of your swimming and totally can relate to the “only 10 miles” thing (on the road not in the water, of course). I’ve heard awesome things about that 10K too, and to do it with such an inspiring purpose makes it even better. I will be donating! amy, you are an amazing women. look at this post!